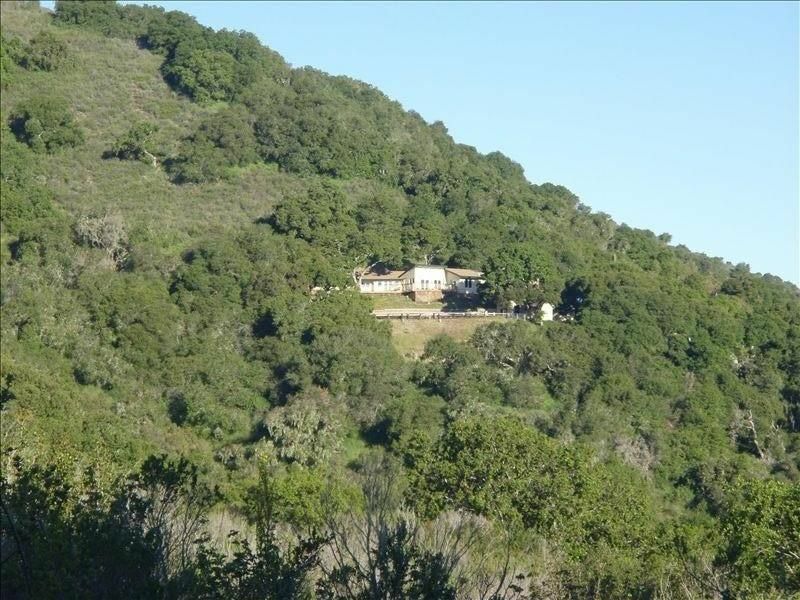 Beautiful 4 Bedroom Carmel Valley Home 600' above Carmel Valley Road Nestled under Oak Trees. The home is on a 10 acre parcel near Garland Park creating a complete outdoor and natural setting. At night, the stars are stunning. The home has spectacular views of Carmel Valley, a very large solar heated private pool (summer use only) and hot tub with plenty of privacy. Despite the tranquil and peaceful setting, the home is only a 10 minute drive to the Carmel Valley mid-valley shopping area, Carmel Valley Village, numerous wineries and golf courses and a 20 minute drive to the Beach, Restaurant and Shops at Carmel by the Sea. The home has hardwood floors, a wood burning fireplace, open kitchen and living room with a 1200 square foot deck which wraps around the home. There is cable TV, wifi and VCR. The master bedroom and main guest room each has a queen side bed, the second guest room has two twin beds plus a children's play area and the fourth bed room has a bunk bed and trundle plus a TV/VCR unit. A crib is available. Each Bedroom has views, a skylight and french doors leading directly onto the deck. Also, guests can play horse shoes or simply bbq by the pool. We have three kids and the home has plenty of puzzles, board games, and kid toys. The home offers a peaceful place to relax by the pool or fireplace or hiking in Garland Park or visit the local wineries and great restaurants. Enjoy awesome road biking, hiking, mountain biking and golf or a trip to the Beach in Carmel By the Sea or the Monterey Aquarium. FYI- guest need to supply their own charcoal for the bbq and wood for the fire place. We price the home for 6 guests with a maximum of 9 total guests. Extra guests over six guests are charged $25 per person per night. Generally, up to six adults will be permitted. We permit dogs at $20 per night per dog so long as the dog does not go on the furniture or beds. Pet owners are required to clean up after their pets. This park is home to a variety of landscapes that occur at elevations from 200 to 2000 feet. From the willow covered banks of the Carmel River through the cottonwood-sycamore stands of the old floodplain. Atop the northern crest of the Santa Lucia Mountains, the trails encounter open oak savannas and spectacular vistas. Along the way, you will travel through maple-filled canyons, dense oak woodlands, and thick stands of chaparral. Garzas Creek gently bisects the park and provides a peaceful, shaded trail that reaches a secluded side canyon of redwoods. Our family loves our hikes in Garland Park with miles of trails, vistas and wildlife. Our enjoy using the swimming pool in the summer with views into Carmel Valley. The remote feeling and natural setting yet only 10 minutes from a local Safeway, great wineries, golf courses, and restaurants is the best of both worlds. Fantastic Views of Garland Park and Carmel Valley. The pool is 55 feet by 22 feet - it is extremely large pool. We have recently installed solar heating for the pool. we enjoyed a wonderful Christmas in this beautiful home with gorgeous views. We had a wonderful weekend stay at this beautiful property tucked in the hills of Carmel Valley. The house and amenities were perfect and the view and pool were unbeatable. We hope to come back sometime! This is the perfect place if you are looking to get away for rest and relaxation! It is perfectly nestled in the mountain and provides an excellent view of the forest, valley, and outdoors! We were even able to see live deer in the backyard! The pool is expansive and set at the perfect temperature. There are several lime trees on the property and other beautiful foliage! There are many things to do such as wineries, eateries, and shopping close by! The weather was exceptional and we enjoyed stunning sunsets on the deck! We did not want to leave this incredible area. Thank you for the use of your spectacular home! The house we stayed at really allowed us to feel stress free and on a getaway vacation. The remoteness and sheer beauty of the site & its views only added to the wonderful experience. What makes this space unique is it can easily accommodate dogs and families of all ages. The pool, hot tub & deck are magical all times of the day. The views are breath taking and there are so many birds and occasional deer to be seen. The kitchen, living room, dining room and bedrooms are spacious and bright. Lastly, the proximity to Carmel, Carmel Valley and Monterey is fantastics. Overall, this will be a destination for our families for years to come. Rates vary depending on season and number of guests Dogs which do not sleep on beds or go on furniture are permitted at $20.00 per day per pet.